A great indicator of really being on holiday from day-to-day life is losing track of time. In this regard, we've done great and, thus, consider this trip a huge success. It's already Tuesday night, day 11 of our trip, and we weren't sure what day it was when we woke up this morning. And we woke up to a partly cloudy sky after a few really enjoyable days the past few days. 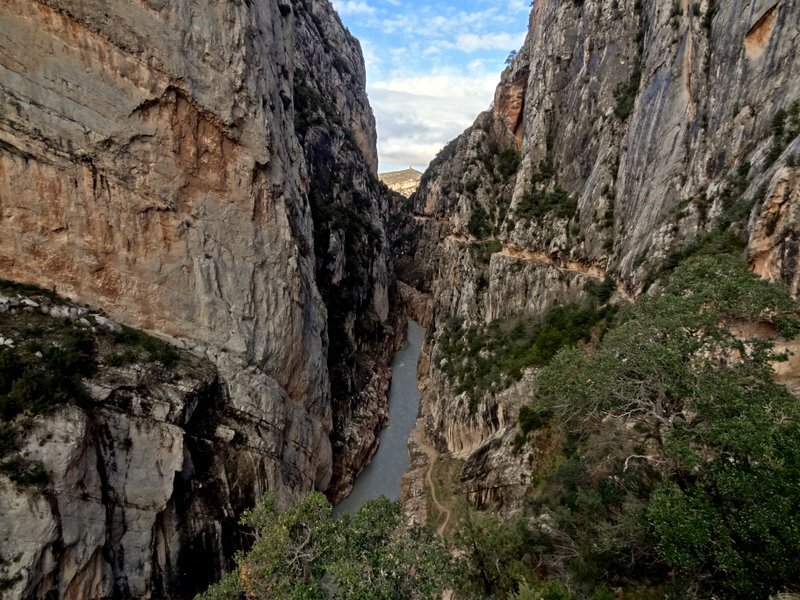 Since I last posted on this blog on Saturday, we've done quite a bit of climbing and a little bit of tourism. Sunday we drove 45 minutes south to the village of Santa Linya to climb there. It was a gorgeous day with no clouds--a first for us since we left Barcelona. We climbed at the Futbol wall outside the village and had a blast. I'd best describe the rock as "chunky" limetone--slightly overhanging, soft grips and athletic climbing. This area was a favorite of ours in Spain thus far. We both really enjoyed the style of climbing and the scene. Sunday was Easter Sunday and it was surprisingly busy around the villages. Santa Linya climbing is really know for the spectacular Cova Gran, a gigantic cave offering huge enduro routes. 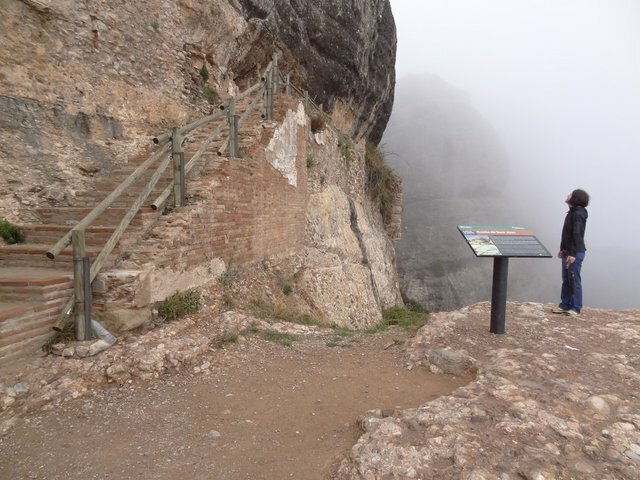 Needless to say, we did not climb in Cova Gran but did enjoy going to check it out. When we got back to our apartment we asked Gaspar, in my broken Spanish, if his restaurant downstairs was open for dinner. He said not normally but that he'd cook us steak and potatoes if we'd like that. Absolutely! So at 9pm, we headed down for a super tasty steak dinner with french fries. Gaspar and his wife (and another man that we don't his relation) kindly served dinner to just the two of us. In addition to the steak and french fries, we had a bottle of tempranillo red wine, bread and jamón serrano with olive oil drizzled on it. It was a pleasant and tasty meal. Monday we had another leisurely morning before heading down to the local crag, Collegats, to climb a few routes at a limestone sector called L'Argenteria. 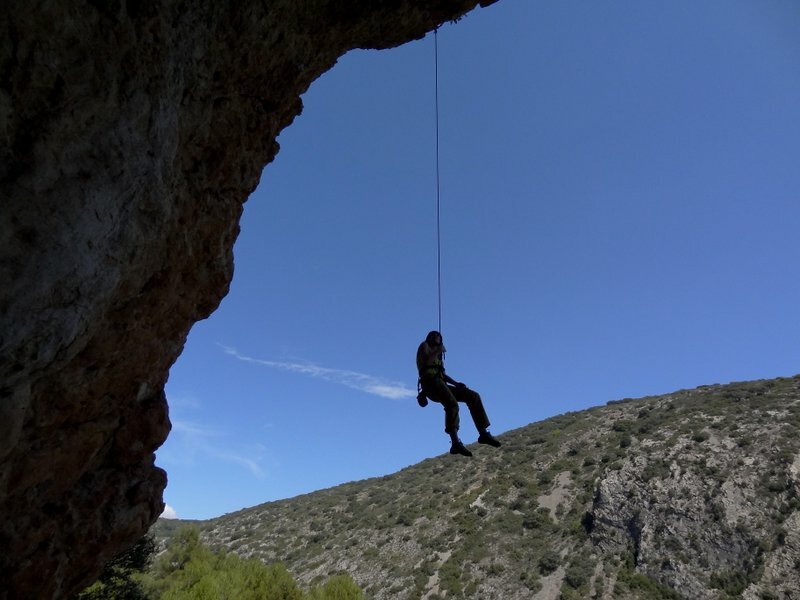 It was cool and shady climbing in the morning but we still enjoyed three distinctly different routes--a slabby route, a bolted crack/dihedral route and an overhanging, heavily featured route sporting badass tufas and neat rock fluting out of a cave. After a few routes we decided to head north into the Pyrenees and to the country of Andorra to cross "visit Andorra" off our bucket lists. 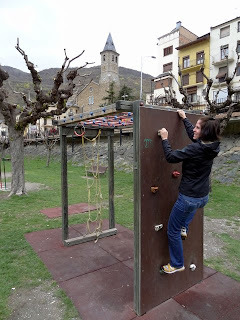 Granted we didn't see much of Andorra beyond the downtown area of its capital, Andorra La Vella, but we enjoyed a tasty lunch of pizza and Allison's new favorite food, tapas de ham croquettes. 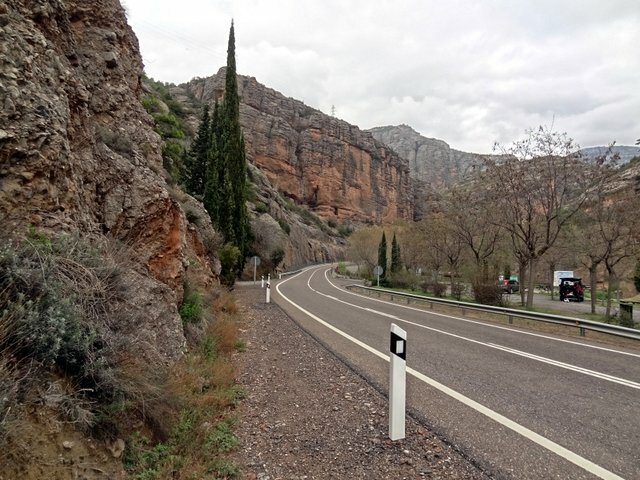 It's been a lot of fun driving the very European roads of Catalunya--narrow, winding and fast. In some of the towns great care must be taken on the car-and-a-half width roads. A driver with a poor sense of situational awareness wouldn't last long here. Today, Tuesday, we our most fun day of climbing yet. 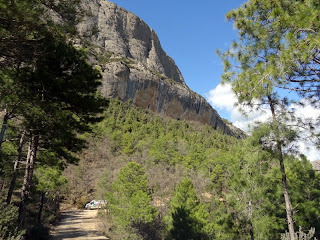 And surprisingly it wasn't at any of the "big name" crags of Catalunya but rather at a small, generally unimpressive-looking crag called Tartareu. For us, it was just what we were looking for--nice weather, slightly overhanging climbing with good holds on somewhat chunky rock. And what really made it nice is that we had the entire area to ourselves all day. No others smoking and no noises save the birds and winds. To top it off, we both climbed well and really ate up the athletic style of climbing. The soft grading didn't hurt our egos either. This is our last night in our fantastic apartment at Camping Beta. 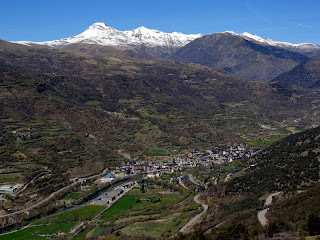 Tomorrow morning we bid Gaspar and the town of Baro adieu and head 90 minutes south to Lleida. Thursday night will find us back in Barcelona at a hotel near the airport and Friday we leave Spain and arrive back in New Mexico around 9pm (assuming no travel delays). In my best Herbert Kornfeld voice, "What tha dilly yo, mah homies?" It's been a very enjoyable few days since I rapped at 'cha ya'll. Thursday we slept in until 8am or so, brewed up some coffee and had a light breakfast before heading out into the rain with hopes that we'd find something dry to climb. If not, we'd do some hiking and exploring some other area of Catalunya because there's so much to see anyway. So we drove the few miles south to the crag nearest our apartment, Collegats. Collegats has a staggering amount of conglomerate walls as well as many limestone walls. We hiked up to the Sector Cine under dark clouds knowing that the short reprieve of rain would not last. Nonetheless, we found a route, Blue Velvet, that looked mostly dry and within our we-haven't-climbed-in-ten-days abilities. Rated 6a+ (5.10c), it was enjoyable romp up fun bulges of conglomerate cobbles for 60 feet. As I was leading it the rain starting to come down. By the time I had lowered back to the ground, it was a steady drizzle of rain. Allison chose to TR the line since wet cobbles tend to be very slick. But she was so psyched to be climbing that she TRed it twice despite water running down her sleeves each time she put her hands on the top-side of the bulges. 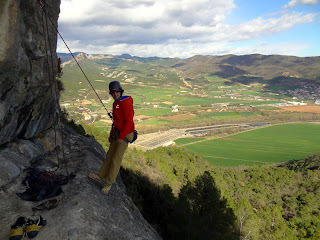 It was fun to be climbing in a new part of the world despite getting soaked. We packed up and headed back to the car. Desiring to see a bit more of the area we drove for about 30 minutes up the nearby Vall Fosco. In addition to seven lakes, each one above the other, there's a tramway up there and we thought that would be fun. Unfortunately when we got to the tramway, it was snowing hard, visibility was zero and the tram was closed. Oh well. We beat feet and returned to the apartment and then to the local grocery store in Sort. A homey kind of day. 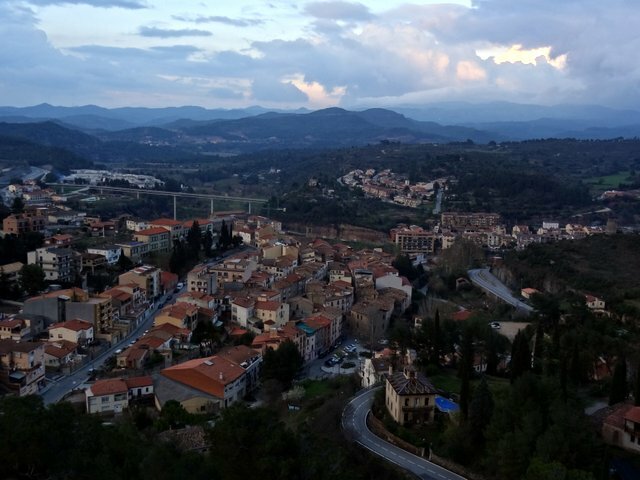 But the rain did stop around 5pm affording me an hour or so to get in a nice 7 mile run up the hillside outside of Baro through the small town of Arcalis. The clouds cleared long enough for me to get a great view down into the valley and see Baro and north to Sort. I didn't have my camera though. We awoke to rain Friday but it tapered off so we loaded up the car and headed south for about 40 minutes to the superb climbing of Terradets. On the way we figured out how to fuel up our car. 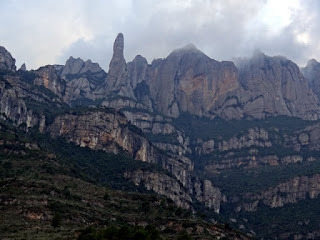 :-) Terradets was a blast and we got in a pretty full day of climbing there despite getting pelted by rain on our last route of the day, L'Ansia. We climbed six pitches of rock before the rain came in again so we were psyched. We then headed to the impressive gorge of Congst de Mont-Rebei. It rained and snowed hard as we drove to the trailhead for the gorge but once we arrived, the rain stopped, the clouds lifted and the sun even came out for a while! We enjoyed a two-hour hike down to, and through, the gorge. It's very impressive and the blueish color of the water flowing through the gorge is mighty pretty. Today we had another leisurely morning as it looked rainy outside but quickly cleared. We headed south from our apartment to visit the lesser-known crag of Coll de Nargo. It was sunny and nice to be out on some easy, single pitch routes. Nothing particularly inspiring but nice nonetheless. 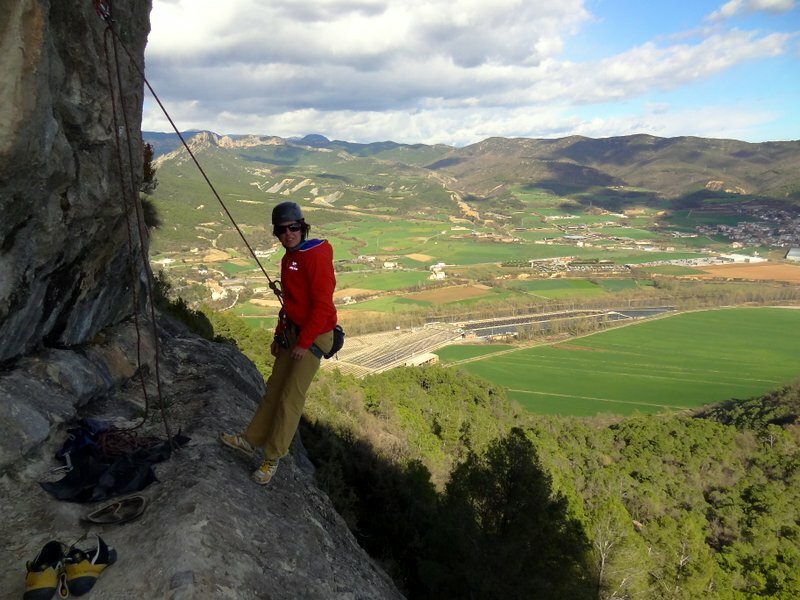 After four routes there, we decided to go check out the world-class crag of Oliana. 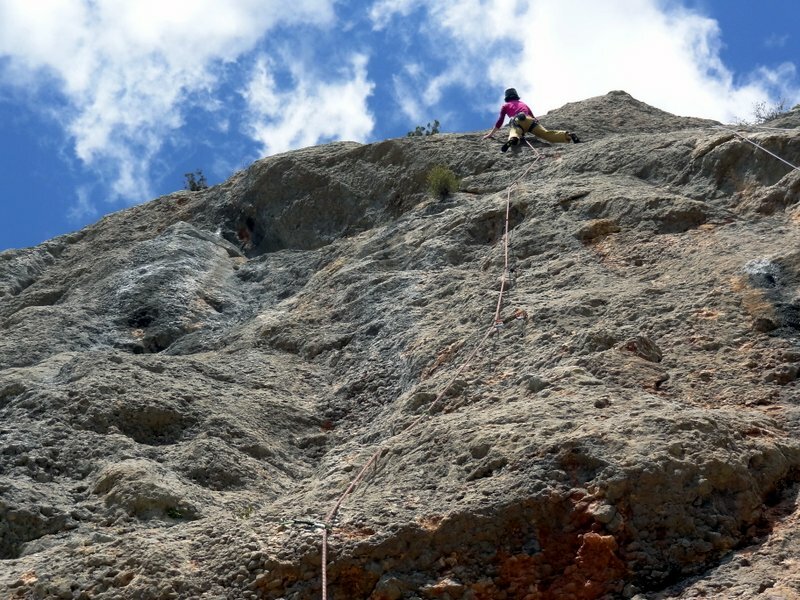 Oliana is the crag of multiple 5.15s and synonymous with high-end sport climbing. Last year, Chris Sharma sent two 5.15s in a day there and this spring it's been THE place for hard female climbing with at least three women sending "Mind Control". 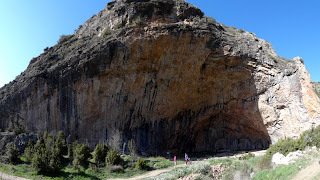 Even though we'd be looking for the less-than-5.12 routes at Oliana, It excited us to see the area in person. It was an easy ten minute hike up to the severely overhanging, orange-with-gorgeous-blue-streaks wall. It's mind-boggling to see how steep the wall is at the top and see the tiny holds the best sport climbers in the world can hold on to. 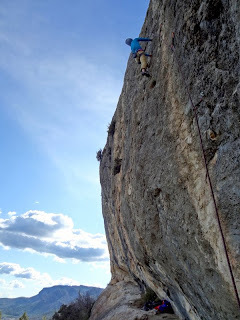 We headed to the far right-end of the crag and climbed a couple 5.10+ routes before moving closer to the center of the wall where I got on the lower part of some 5.ridiculous route. The route had draws hanging on it so there was no commitment. I managed to get up to the fifth draw, through the junky-rock climbing, to where the rock got beautiful. And that was it. A couple of falls and I was done. And we were done with the day. A fabulous day! Back at the apartment I cooked up some chicken paella and we filled our bellies. Buenas noches! Hanging out at the right end of the wall. Can't beat the view. We're psyched about the apartment! 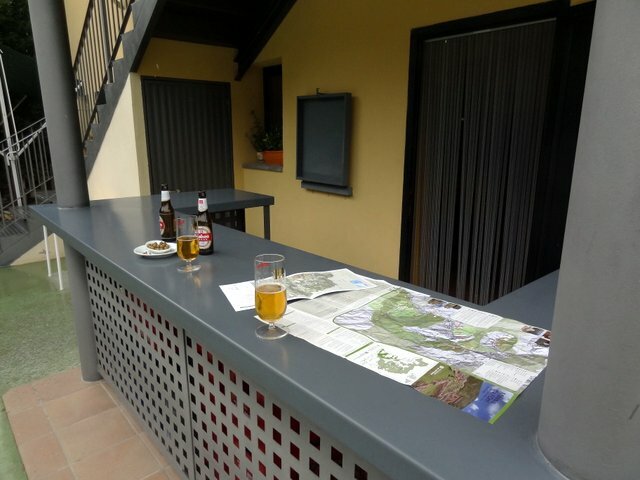 It's very nice and spacious in an easy-to-access and scenic location in Baro along the banks of the Rio Noguera Pallaresa. It's a nicely-located place with many hiking trails and climbing areas within 45 minutes in any direction. We're very close to the Pyrenees mountains to our north, the country of Andorra to our east, loads of climbing to our south and more scenic trails and lakes to our west. 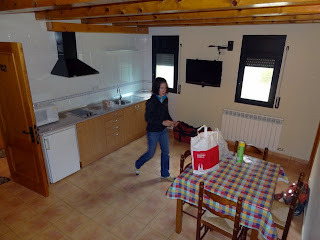 We hit the three grocery stores in Sort, Spain this evening and cooked up a meal here in the apartment tonight. I can feel our wallets getting heavier already with all the money we're saving cooking "at home". Champagne compliments of Gaspar. Very generous. We haven't done any climbing yet but this trip isn't all about the climbing and we're enjoying the experience as a whole. The travel, the relaxation, the food, the company, and the surroundings. 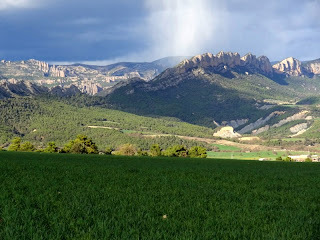 Yesterday we rented a car from the Barcelona airport and headed out of town and to the hills on Montserrat. 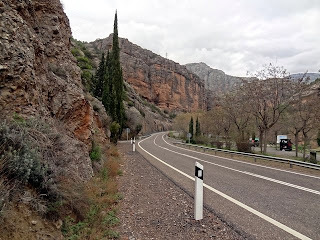 It was about an hour of driving from the airport, through one major wrong turn and to the hostel, Hostel Guilleumes, in the town of Monistrol de Montserrat. It was a rainy morning but dried up a bit for the afternoon allowing us time to hike the trails of the Montserrat mountains, explore the Santa Maria de Montserrat monastery and ride a funicular (the steepest funicular in Spain) up high into the mountains. We had hoped to some climbing on the cool conglomerate rock of Montserrat but the rain earlier in the day had left things damp and slick. 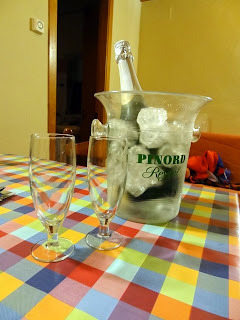 We had a very nice three-course dinner last night in the restaurant below the hostel while watching Barcelona's futbol team beat Milan 3 to 1 with a spirited group of fans. It rained hard, with plenty of lightning and thunder last night, so there will be no climbing today. Intead, we'll drive to Baro where we have arranged an apartment rental for the next week at Camping Beta. Hopefully we'll find some dry rock to climb later today but it's not likely. Tomorrow looks to be party cloudy while Friday looks to be wet again. However, the forecast for next week looks good right now so we're optimistic about getting some climbing in then. Hola desde España, peeps. After 27 hours of travel yesterday, Allison and I got settled into our hotel room in the Hotel Via Augusta in Barcelona. We were pooped! The travel went well save a small screw-up in Madrid where American Airlines apparently didn't have us properly booked on partner airline Iberia's flight to Barcelona. Sadly, I missed the Barcelona Marathon by one week. I probably would have won. Oh well, maybe next year. After arriving in the hotel we immediately napped for a solid four hours. We dragged ourselves out of the room for a short stroll a few blocks up to a small pizzeria with outdoor seating in a tiny courtyard where we scored some tapas, pizza and beer before retiring back to our room. We slept hard for 10.5 hours. I think we're adjusted now! Today we walked and rode the excellent city metro all day today seeing many of the more popular sites of Barcelona. With a sunny, clear sky and a high in the low 60s, it was a beautiful day to be out exploring the city. And it's Allison's birthday! A super fine day! Admittedly, though, after our big day of travel I didn't realize it was already April 1st and blew it on the birthday wishes until the late afternoon. Shame on me. 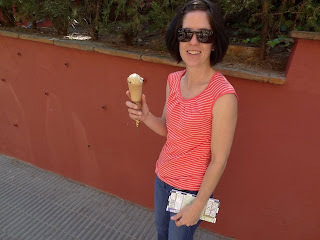 But we did have some birthday helado after walking around the cool Park Güell designed by Gaudí in 1900. 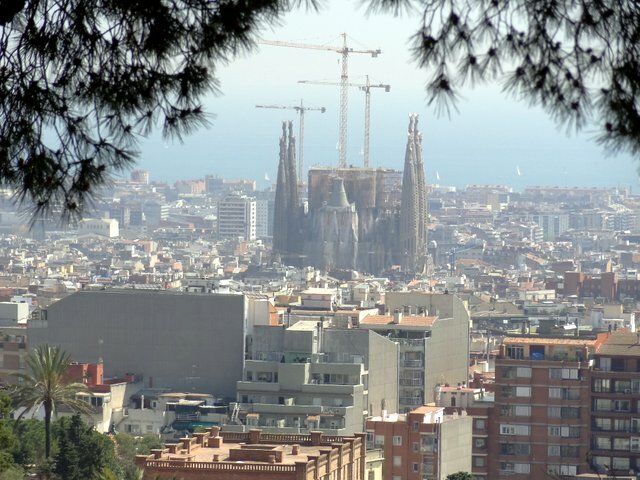 Tomorrow we plan to see more of the city including the very popular La Sagrada Familia Church. We tried to get in today but the line wrapped around the block, and then some.